There will be no garbage, recycling or compostables collection service for most Waste Management customers in King and Snohomish counties on Thursday, Oct. 11, due to a natural gas pipeline rupture in British Columbia. The pipeline rupture has interrupted the flow of natural gas for Puget Sound Energy, which delivers natural gas for Waste Management trucks. The duration of the suspension is unclear. Areas that will not have Waste Management service on Thursday, Oct. 11, include Algona, Auburn, Federal Way, Kirkland, Mill Creek, Redmond, Seattle, Snoqualmie, and the unincorporated areas of King and Snohomish counties. Services have not been interrupted in or around Marysville (including Arlington, Granite Falls or the unincorporated area), Skagit County or Kitsap County because Waste Management uses different fuel suppliers for trucks in these areas. Here’s the WM service-alert link. This morning, we reported on Puget Sound Energy‘s call for gas customers to conserve because of the pipeline problem; PSE is now asking for that conservation to continue Thursday. BUDGET MEETING WITH COUNCILMEMBER HERBOLD: FCA president Mike Dey said City Councilmember Lisa Herbold convened representatives of at least a dozen neighborhoods a night earlier to talk about the budget. They are being invited to sign on to a letter supporting increases in fines/fees to support SDCI monitoring vacant buildings proactively. Also discussed: Funding for paving. SDOT might delay some West Seattle repaving (Roxbury and part of 35th) until 2023 because the Avalon repaving is going to stay on track (Delridge repaving also is in the works); Herbold wants support for pressing to keep all the repaving on track. Dey said they also talked about the need for more police but Herbold felt that would be tough because of the back pay in the new police contract; he said Herbold suggested that they should focus on recruiting now and depending on how that goes, come back in the second half of the year and talk about more staffing. SCALE HALA MHA EIS APPEAL: The citywide coalition challenging the environmental impact report for Mandatory Housing Affordability upzoning has raised almost $200,000 and needs about $20,000 for the lawyers who are handling the appeal, to which FCA is a party. The Hearing Examiner’s ruling is due before Thanksgiving. HISTORIC BUILDING? There’s talk of investigating a landmark designation for the commercial building that holds Endolyne Joe’s (WSB sponsor), the Original Bakery, and other businesses. They’ll be talking with Historic Seattle. The 1926-built building is more significant for its history than its architecture. The idea is in a very early stage. Board members agreed that the overall levy list – totaling $1.4 billion – looked “solid.” But as the hourlong meeting concluded, they also stressed that “community input is still welcome,” as board member Eden Mack put it. Board contact info is at lower right on this page. And watch for word of a public hearing on the levy in late October; BEX V, and the district’s next three-year Operations Levy, will go to voters next February. Congratulations to Chief Sealth International High School football standout Dontae McMillan, announced today as a Washington Interscholastic Activities Association Player of the Week. He’s led the Seahawks to four consecutive wins. From the WIAA announcement: “The running back ran for 279 yards on 21 carries and scored four touchdowns, as the Seahawks took down Lakeside 48-31. His longest run of the night was a 94-yard scramble on third down.” Every week, the organization honors “varsity athletes who exhibited an outstanding performance for the previous week (based off nominations).” This Friday night at 7 pm, you can see McMillan and his teammates play Sammamish at home at Southwest Athletic Complex (2801 SW Thistle). The cover image for the map/postcard promoting this quarter’s West Seattle Art Walk events – starting with tomorrow night’s WSAW – always has a backstory. This time around, there’s a lot to tell. The image is a painting by Frances Smersh, the West Seattle artist who is co-proprietor of Junction shop Click! Design That Fits (WSB sponsor) with her husband John Smersh. She is also this month’s featured WSAW artist there, so you can visit Frances and her work there Thursday night (October 11th) 5-8 pm. In conjunction with the showcase, Click! has an update for the community about the personal news they first shared three years ago – that Frances is living with younger-onset Alzheimer’s Disease. If you or someone you know would enjoy spending time or sharing a meal with (or providing a meal for) Frances, please reach out to John and let him know what you would be up for. She loves being with people and is pretty game for most activities. Friends have started a GoFundMe page in hopes of helping with some of the extra expenses they now face; donations of any amount are hugely appreciated. Read the full update here. And go see Frances’s show at Click! on Thursday night, 4540 California SW, 5-8 pm. Ever since the first tip that Saigon Pho (2632 Alki SW) had apparently closed, we’ve been checking on it; more than a week has gone by, and it hasn’t reopened. No explanatory/farewell sign, and we haven’t been able to reach the restaurant’s proprietor, but a peek through the window shows furnishings and other items stacked and boxed. While that building’s site has long had a mixed-use redevelopment proposal, newer documents in city files show a plan to expand the neighboring preschool/day care into the building. The latter three spaces are all posted with FOR LEASE signs. 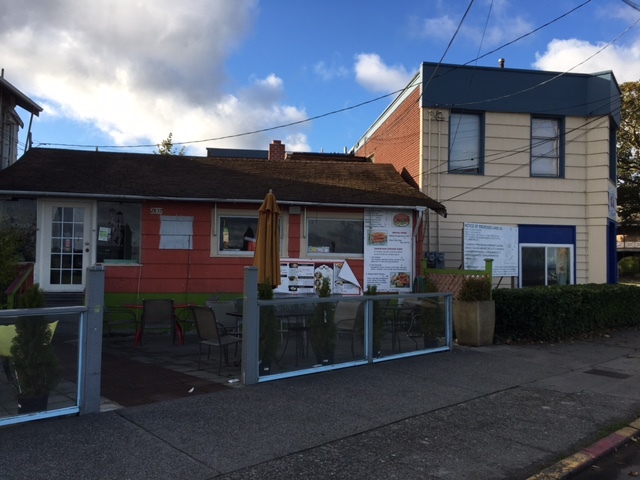 At the ex-sushi spot (2758 Alki SW), an application is in the city system to add second-floor apartments to the building, as was proposed in 2009. Do it for the Southern Resident Killer Whales: Be part of Duwamish Alive! | Comments Off on Do it for the Southern Resident Killer Whales: Be part of Duwamish Alive! What is the connection between the Duwamish River and our local Orca? The Duwamish River is home to 5 species of salmon, including the vital Chinook, which is a critical food source for Puget Sound Orca. Orca depend on the dwindling Chinook runs for the majority of their diet, and Chinook depend on healthy salmon habitat in the Duwamish. Duwamish Alive! on October 20th will have volunteers working throughout the Duwamish Watershed to improve the health of our green spaces, creeks and especially our Duwamish River, which provide salmon critical habitat. Volunteers are needed at many local sites which provide critical habitat for our community and our river. A special opening ceremony will be held at T107 Park, across from the Duwamish Longhouse at 10:00, with special honoring of George Blumberg and Willard Brown for their work in restoring the Duwamish. To volunteer, visit DuwamishAlive.org to see the different volunteer opportunities and to the contact for the site of your choice, or email info@duwamishalive.org This is a family-friendly event for all ages – tools, instruction and snacks are provided. The two sites with opening ceremonies are only two of many along the river and its watershed. West Seattle Wednesday: Flu shots, schools, buses, Disaster Trivia, more! Metro and Seattle will share updates on the project, including the future route proposal and station locations, and seek feedback on RapidRide station amenities and improvements that make it easier for people to reach transit. The City of Seattle will also share its early design for a reimagined Delridge Way Southwest with bus lanes, landscaped medians, crosswalk improvements, protected bike lanes and neighborhood greenway connections, signal upgrades, paving, water and sewer pipe upgrades, spot parking and bike lane removal, and public art. If you have natural-gas service, it’s supplied by Puget Sound Energy, and they’ve sent customers a message asking for conservation today because of a pipeline rupture in Canada. If you haven’t already seen the message, you can read the full version on PSE’s website. (PSE also is asking its electricity customers to use less, but that doesn’t apply in our area as local electricity comes from Seattle City Light.) Here’s Canadian coverage of the pipeline rupture, which happened near Prince George, British Columbia [map] – and even more info here. 7:06 AM: Good morning! No incidents reported in/from West Seattle. NATIONAL WALK TO SCHOOL DAY … is today. LOOKING AHEAD: Friday (October 12th), no classes for Seattle Public Schools and those who keep the same schedule … This weekend brings a southbound 99 closure – details here. Puget Soundkeeper is searching for dedicated volunteers to survey the Coho salmon that return to Longfellow Creek in West Seattle. During the salmon run each fall, a population of Coho salmon enters the Duwamish River from Elliott Bay, and then swims up Longfellow Creek to spawn. As Coho migrate through urbanized waterways like Longfellow, they encounter a chemical cocktail of toxic runoff from roadways and other paved surfaces. These chemicals severely disorient adult Coho and result in “pre-spawn mortality” in many individuals, meaning the salmon die before reproducing. Previous surveys conducted by the City of Seattle and NOAA on Longfellow Creek have found pre-spawn mortality rates of up to 90% amongst females, an alarmingly high statistic. Examining the number of salmon that return to Longfellow Creek every year and documenting the pre-spawn mortality rate are great indicators of the health of our local waterways. Data gathered from these surveys shared with NOAA, the City of Seattle, Department of Fish and Wildlife and King County. Volunteers will attend an orientation meeting (tonight) Wednesday, October 10th from 6:30-8:30 pm in West Seattle. · The nature of this work is geared toward adults only. · Surveying is a weekly commitment that takes approximately 1 hour to complete. The salmon run begins in mid-October and finishes mid-December, during which there will be a survey every day. Volunteers will be divided into teams of 2-3 people and assigned a weekday to conduct their survey. · We’re looking for adventurous volunteers! Surveying requires handling fish carcasses found in the creek (with gloves) and dissecting the female salmon to check for eggs. · Volunteers should be in good physical condition. Surveying in Longfellow Creek requires climbing up and down steep muddy embankments and wading through shallow water on uneven terrain. · Surveying is conducted in varying weather conditions. If conditions are dangerous (e.g. a downpour), we will cancel on that day. Otherwise, we survey rain or shine. · Volunteers will be provided with surveying kits and waders (unless you have your own pair). Data collected during the survey will be uploaded by the volunteers into Puget Soundkeeper’s database. Salmon surveys are a great way to observe one of nature’s most amazing migrations and experience scientific field work. The data we collect from these surveys help us understand the effects of toxic runoff on one of the Pacific Northwest’s most iconic species and determine the best methods to protect them in the future! Contact Morgan (morgan@pugetsoundkeeper.org) with additional questions. Morgan can tell you where to be for tonight’s orientation, too!